Rise to power in the King's council. The King of Blackthorn rose to power on the strength of his sword, but he has grown old and is no longer a vital leader of his country. Others have risen to power within his council. In a battle of subterfuge, the councilors ruthlessly vie against one another for true control of Blackthorn. Whispers of treason echo through the halls. As a member of the Council of Blackthorn, you must build influence with the kingdom's factions to expand your political influence. 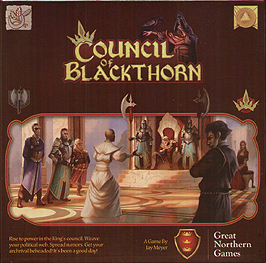 Council of Blackthorn is about secretly gaining power, spreading rumors, and convincing your rivals that you are not a threat. Unique game mechanic for building influence. Simple Mechanic - Deep Strategy. Players do not know who has scored the most influence points until the end of the game. Keeps everyone engaged! The King will behead one player for Treason. No one knows for sure who it will be until the last dramatic moment of the game! Six different characters to play, each with unique powers.